June 25, 3:45 p.m. – The velvety smell of melted butter mingling with oozing blueberries permeates my kitchen right now as a rye and berry tart bakes. The aroma lures me from the sofa where I am opening a new book I am eager to read. I set the book down and walk over to the oven, opening the door and beholding what I see inside. The crust, made from organic all-purpose flour mixed with dark rye flour, has turned a golden brown. The sour cream-based filling has puffed up, transforming from a thin coating at the bottom of the shell into a plump, luscious filling that cradles the glistening purple berries. In just a few minutes, the tart will be ready to remove from the oven. I will set it down on a wire rack and wait, resisting the urge to slide a knife through the hot filling and take a bite while it is still warm. Such is the discipline of a baker. The pastry still warm from the oven is one of the greatest temptations. Waiting must sometimes be accompanied by diversions. So I will return to the sofa, pick up my book, and begin to read. This attractive and delicious tart, adapted (barely) from the Nordic Bakery Cookbook, features a crust made from a combination of all-purpose flour and dark rye flour. The proportions mentioned below come from the original recipe and produce results that are sure to please. Since I enjoy the taste of rye, I’ll try increasing the amount of rye flour next time and might even try substituting the all-purpose flour with some other types. Preheat oven to 400 degrees. Butter a 10-inch fluted tart pan with removable base. Prepare the crust by beating butter and sugar until well mixed, then gradually beating in the egg. Add the flours and baking powder and mix to create a dough. Press the dough into the tart pan, evenly covering the bottom and sides. 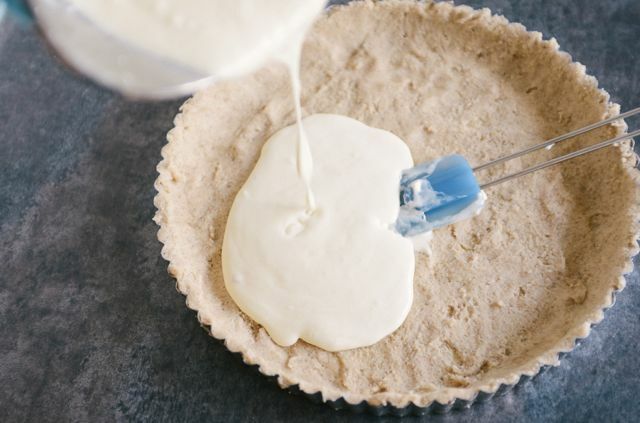 Make the filling by mixing together the sour cream, heavy cream, egg, sugar, and almond extract, then pour into the crust. Evenly distribute the blueberries over the filling and bake until the filling has set and the crust is golden, about 25 minutes. This looks so good and blueberries are good for you too. You are welcome! This tart was delicious. Let me know if you try it! This tart recipe looks amazing! What workable sugar substitutes might you recommend for this?